Brooklyn Nine-Nine is an American police television sitcom that first premiered on Fox in 2013. The famed series spins around Jake Peralta, an amateur but talented NYPD detective in Brooklyn’s 99th Precinct. It is one of the most delighting sitcoms that follows into the lives of detectives in a New York precinct. Earlier in May 2018, Brooklyn Nine-Nine fans went through a rush of emotions when out of the blue, Fox, decided to cancel the show. However, just 31 hours after it was canceled, the show was picked up by NBC, thanks to an overwhelming celebrity and fan support. Fans of Brooklyn Nine-Nine were heartbroken when the Fox network canceled the unique comedy earlier this year. After all, the show accomplishes something very few other shows ever have – celebrating American diversity in a way that is truly funny. Fox did state why it has decided to cancel the show. Even though the officials at Fox stated that they had only delayed because the time didn’t feel right and because there were other presumably “more important” things to take care of. But it did seem that the producers are losing interest in it. A hashtag was also trending on Twitter in full support of the series. On May 11, 2018, the day after the announcement of its cancellation, NBC officially picked up the series for a 13-episode sixth season. It is expected that all existing main cast members are expected to return for the sixth season, which is set to premiere in 2019. What’s new is that NBC arranged for 5 additional episodes of the sixth season, increasing the total episode count to 18. Brooklyn Nine-Nine will air Thursdays at 9:00 pm starting January 10, 2019. 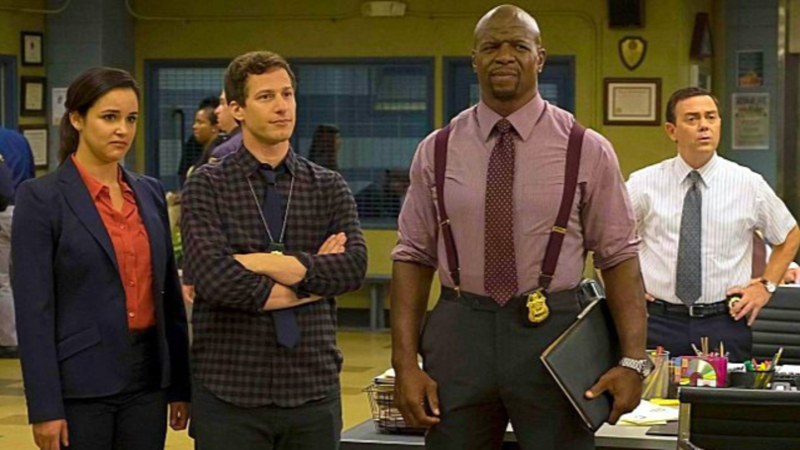 Brooklyn Nine-Nine’s main and supporting cast features Stephanie Beatriz as Rosa Diaz, Terry Crews as Terry Jeffords, Melissa Fumero as Amy Santiago, Joe Lo Truglio as Charles Boyle, Chelsea Peretti as Gina Linetti, Dirk Blocker as Michael Hitchcock and Joel McKinnon Miller as Norm Scully. The fifth season of the television sitcom Brooklyn Nine-Nine premiered on September 26, 2017 on Fox. Fortunately for Brooklyn Nine-Nine fans, NBC has saved the day by picking up the show. Since Season 6 is owned and distributed by NBC, it’s only natural that the show will premiere on NBC. Season 6 will premiere in January 2019, but if you do not live in the US, you will have to wait months before the show is available in your country. The main problem is that US-based streaming services such as NBC, Netflix, and others are limited for access in numerous countries around the globe. If the streaming services are available, they don’t host the entire content the service offers, meaning certain to most shows will be unavailable in most countries. However, you’ve got nothing to fear as a VPN is here! When you’re trying hard to stream a movie or a TV show and keep seeing the error message: “Unfortunately this content is not available in your country,” it means that the show you are trying to stream is not available in your country/region. A VPN will help you avoid regional limitations by hiding your actual location and letting you choose an IP address in a country where Brooklyn Nine-Nine is available. There are many other reasons to use a VPN service such as: boosting your network security, masking your online activities from governments/ISPs or third-party surveillance, and of course, protecting you from hackers and cyber attacks. With PureVPN, you can conveniently stream Brooklyn Nine-Nine along with thousands of other shows that are subject to regional limitations. Bullseye, you’re good to go! PureVPN – Streamers Top Choice! PureVPN is regarded as the best VPN for streaming that can resolve all of your streaming-related matters. PureVPN has proven itself year after year in providing users with a smooth and uninterrupted online streaming experience. With PureVPN, you get past ISP throttling, region blockades, regional limitations, and bandwidth restriction. PureVPN offers its users with more than 2,000 self-optimized servers strategically located around the globe, which are enhanced for a smooth online streaming experience. With great functionality in place, such as split tunneling, and dedicated IP addresses, PureVPN makes it possible for you to enjoy the ultimate streaming experience. A VPN service will help you stream online content while ensuring the utmost security of your digital presence. You’ll get to avoid regional blockades & gain access to any inaccessible content as long as you’ve got a working internet connection.